The Mid-Atlantic Ridge is part of the longest mountain range in the world, which for the most part lies beneath the Atlantic Ocean, running from North-East Greenland all the way down to the South Atlantic over a distance of 65.000km. The majority of the peak of the ridge line lies at 2.500m below sea-level, but there are areas where it rises so high that it reaches above the surface and creates islands, such as the Azores and Iceland. The Ridge is the divide between the North American and the Eurasian Tectonic Plates and the South American and African Continental plates. When the plates started to move apart 150 million years ago, lava pushed out from underneath the earths crust and flowed out into the cold waters of the Atlantic Ocean. This lava solidifies upon contact with the water, yet a continuous flow of magma from the core pushes it higher, and over time, the Mid-Atlantic Ridge was formed. When this fissure of volcanic activity merged with the volcanic hot spot in the Greenland Sea, it created such a forceful up-welling of magma that the mountain range breached the surface and continued to erupt, eventually forming the island of Iceland. 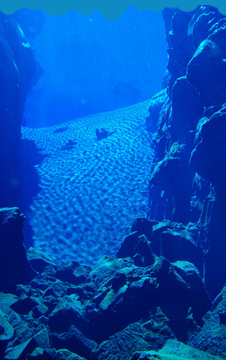 The geology of Silfra and the Thingvellir valley are closely connected to the Mid-Atlantic Ridge and the continental drift that occurs along its length. Every year the tectonic plates drift apart by roughly 2cm, putting the land in between under great tension. Every 10 years or so, this tension is released through major earthquakes. These earthquakes result throughout Iceland in the formation of cracks and fissures, which open up along the tectonic ridge line, none more visible than the ones in Thingvellir. Silfra is one of the fissures in Thingvellir, but one with a slight difference. When the fissure that formed Silfra cracked open the land, it broke through an underwater spring, filling the fissure with the crystal clear water that we see today. Since 1789 when the majority of fissure in Thingvellir, including Silfra, opened up, Silfra has seen many changes with each round of earthquakes resulting in rock falls and collapses. It is this occurrence that send boulders and rocks into the crack, where they eventually get stuck in narrow sections and have other rocks fall on top, creating tunnels and caverns and the depth changes that we see today.